FARMERS can increase yields, efficiency and drastically reduce the cost of ploughing, planting and weeding in the 2014 season following the introduction of mechanized Conservation Agriculture (CA). The new innovation that is being rolled out by the Lower Usuthu Sustainable Land Management (LUSLM) project, funded by the International Fund For Agricultural Development (IFAD) and the Global Environment Facility (GEF), uses tractor drawn Conservation Agriculture implements. Using mechanized conservation agriculture, a farmer can complete land preparation, fertilizing and planting all in one operation and in a fraction of the time it takes with conventional ploughing. This method uses the principles of minimum soil tillage, or “Climate Smart” agriculture practices, advocated by Ministry of Agriculture Principal Secretary, Dr Robert Thwala. A 4x4 John Deer 5503 supplied by Swazi Trac in Matsapha rigged with a 5-tooth rippertyne was unveiled during the first demonstration. 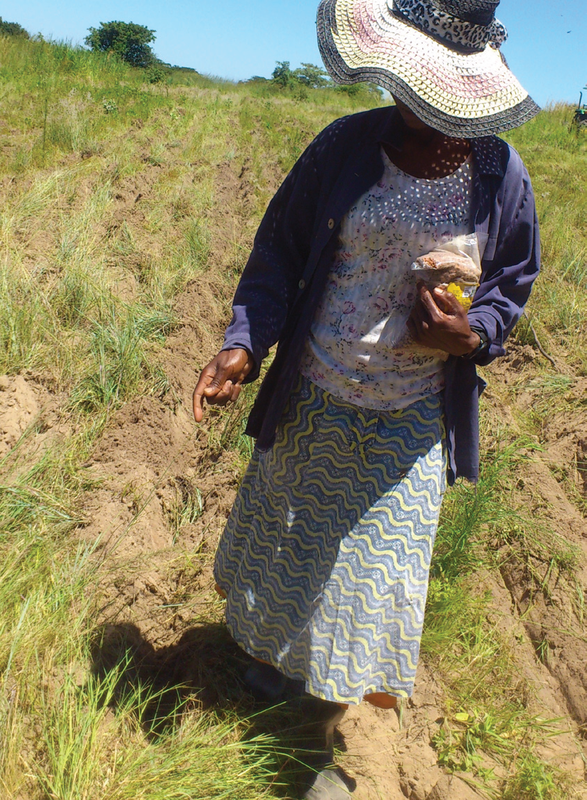 The designated field was just over a hectare, where Lindiwe Magagula (a local farmer) intended to grow legumes. When the tractor starts, the ripper opens five trenches that are almost 25-30 centimetres deep and 45 centimetres apart. The ripper leaves rows of grass between the trenches. Norman Mavuso, a sustainable Agriculture Coordinator, showed Lindiwe how to mix the herbicide and using a sprayer on her back, how to spray the grass with a special Springbok herbicide to dry the grass so that it forms a mulch cover between the rows of plants. The reduced tillage equipment makes it possible for the tractor to open planting lines, apply fertilizer, seed and cover in one pass. The fertilizer dispenser is able to place fertilizer on one side of the trench and the seed on the other, eliminating the danger of the seed being scorched. The tractor drawn no-till equipment is so time efficient that it is possible to plant a maximum of sixteen fields instead of four, assuming that it spends two hours at work. “Last year we conducted a rapid perception survey to understand public attitudes towards CA. We found that even though people see and appreciate the benefits that come with the CA practice, they are discouraged by the heavy manual labor involved. The information was valuable as it convinced us to explore ways of reducing the manual labour through mechanization,” said Mavuso. This observation was confirmed by Lindiwe, who joked that her children run away when it is time to engage in hoeing to dig the planting holes. 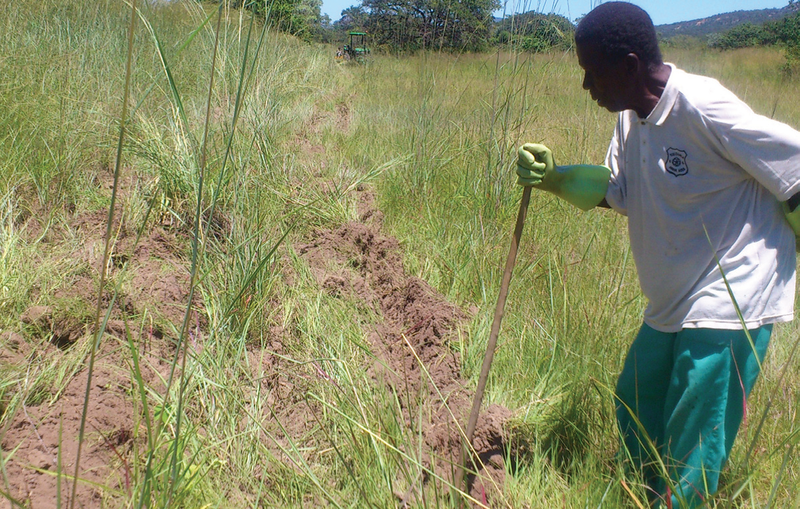 CA was introduced in Swaziland as a poverty alleviation initiative after trials in Zimbabwe and Kenya showed minimum tillage greatly improved productivity at much lower costs. Over the years however it has gained the reputation as a practice for poor people. “We have now realized that to succeed in promoting universal CA, we must recognize that farmers are at different levels of development sophistication. Therefore it is important to deploy not one, but a range of tools so that everyone can find a tool that they can use according to their level of development”, explained Mavuso. Universal implementation of CA is expected to greatly improve national yields, especially for the priority national staple food – maize, by addressing two destructive practices. In some cases, farmers opt to follow the tractor and drop seed as it ploughs. This method is not only inefficient, but the seed is planted too deep into the soil, resulting in limited or no germination or delayed germination. A second problem practice is wrong application of fertilizer. Reliance on rain has scared farmers to adopt cautious approaches to limit their losses in the case it does not rain for a long time. Fertilizer is the most expensive input. As a result, farmers wait until it rains before risking their fertilizer – a very destructive practice. “Farmers now commonly plant seed without fertilizer, and wait for it to grow. They return when the seedling has grown a few centimetres and apply a side dressing with fertilizer. This is a total waste because fertilizer is a combination of three components: Phosphorus, Potassium and Nitrogen. The roots require all three nutrients to develop and feed the plant. Since the roots grow downwards, the fertilizer is wasted because it does not benefit the roots. Some nitrogen is absorbed by the plant, yet potassium and phosphorus could be the most expensive items that are totally wasted. Instead, spreading mulch to provide soil cover is a CA practice that creates compost, thereby replacing nutrients plants constantly remove from the soil. It also preserves moisture. For now, the project is confined to Siphofaneni and Sithobela rural development areas (RDAs). When demand increases, the project plans to scale-up implementation nationally.